Campaigns for new products, best-sellers, agencies, etc. The items and packages may be fragile and affected by seasonal changes; they also may have high commercial value. The media logistics community is attuned to improving working conditions for crews and optimizing logistics costs. Fives designs solutions for order fulfillment and returns processing that are ideal for meeting the special constraints of media logistics.Fives solutions offer proven user-friendly quality and can handle extreme workflow variations with great agility. 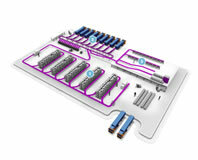 For example, a single GENI-belt® sorter can process order fulfillments and returns.